Hailing back to a simpler time, stolen from the SIxties, the look and feel of this sweet sweater dress make it breathtakingly beautiful. A straight, vest style bodice ends in a mid thigh length hem. Contrasting black single weight knit sleeves are five eighths length and the coordinating turn down collar and front welt pockets make this dress classically pretty. The armholes, neck, and hem are ribbed knit. 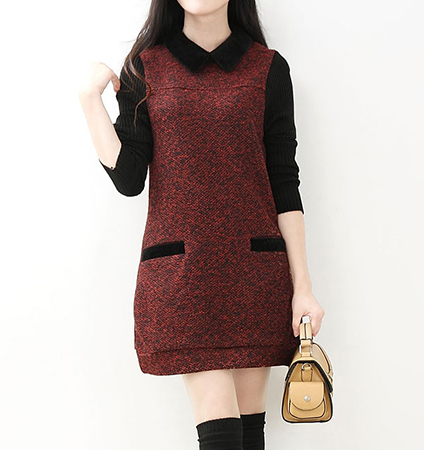 This sweater dress is available in Ruby Red Tweed knit with flecks of black or Deepest Black Tweed knit with flecks of white. Black tights or stockings with ballerina flats are the perfect finish for this dress.